Splinter recalls many, many years ago, when the Turtles were still just young children and he was administering their first lesson in Japanese calligraphy. Leonardo, of course, proves to be gifted and reproduces the Japanese kanji (生) flawlessly. Donatello is too geometric in his brush strokes, not quite getting the spirit of the exercise. Raphael has already given up in frustration, making a mess of paper and ink. Splinter tells him to relax and follow his breathing exercises. Meanwhile, Michelangelo hasn’t drawn the calligraphy at all. He’s drawn several comics of his brothers walking about with humans, wearing human clothes and even having five fingers. This infuriates Splinter, who tells him that as a ninja he can never been seen, nor would he ever be accepted by human society anyway. Michelangelo apologizes and goes back to boring calligraphy. Later that night, Splinter finds more of Mikey’s comics. At first he’s angry, but looking over them, he realizes that they just reflect what’s at the heart of every child: to fit in, to have friends and to be normal. 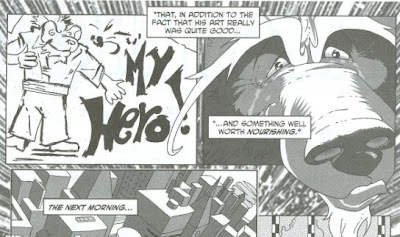 Splinter then finds a drawing of himself with the caption, “My hero!” Moved, and realizing that a talent should be cultivated instead of stifled, Splinter decides to make amends. The next morning, Michelangelo finds a box next to his bed. Inside are lots of art supplies. *Depending on which continuity you ascribe to, this is either the earliest story in the Turtles’ chronology or the second, coming right after “Galahad”. This was a saccharine little short, sure, but it illustrates a part of the TMNT’s upbringing that acts as a good counterweight to other “pre-Teen Turtle” stories, such as “The Passing”. 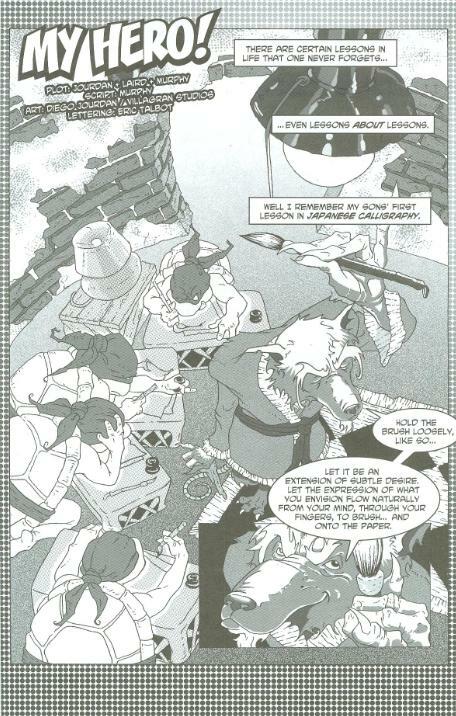 Splinter trained the Turtles from birth for the sole purpose of killing Oroku Saki. Make no mistake about that, he even says as much in TMNT #1. He raised his “children” to be killing machines. Stories like “The Passing” show the Turtles already out in the world, killing ninja as early as age 12, maybe even younger, with scarcely any more than a master/student relationship between them and Splinter. These stories don’t necessarily portray Splinter in the fondest light; it appears like he sees the Turtles more as tools for his own vengeance than anything else. But other stories, particularly “My Hero!” give us the other side of the coin. Splinter is a strict disciplinarian when it comes to his martial arts regiment, but he’s also a father. He loves his kids and he feels empathy for the life of struggle and hardship that he knows they will endure for being different. This story, in particular, seems like something of a turning point for Splinter, where he realizes that at times he needs to be less of a sensei and more of a daddy. Diego Jourdan’s art is very befitting of the tale, overlaying the panels of the Turtles and Splinter atop pages of Mikey’s comic, gradually un-obscuring them over five pages until we see his drawing of Splinter in full. A nice technique that lets the audience “discover” at the same rate as the character. I’m also grateful that he didn’t draw the Turtles looking disgustingly “cute” as a lot of artists doing these “toddler Turtle” flashback stories tend to. Now that I think about it, did either of the TMNT toons ever explain why Splinter taught them ninjitsu? In both cases, they'd never heard of the Shredder until actually meeting him in the show, and then Splinter fills them in. I'm left to the conclusion that Toon Splinter taught them to kill things because why not?